OEM Manufacturer of a wide range of products which include badminton court floorings. Badminton court flooring material, installation also can be done. 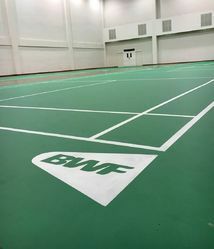 Imported Flooring mats for badminton courts having thickness 4.5mm , 6 mm and up to 9 mm. High grade Olympic certified sports flooring.